In 1612, Antonio Neri published his famous book on glassmaking, L'Arte Vetraria. The venture was apparently bankrolled by Medici prince Don Antonio for whom Neri had worked as an alchemist and glassmaker in 1601 and possible a couple of years earlier. The printer was Giunti, the venerated Florentine family of typographers who set up their first press in Venice a century and a half earlier. In Neri's era, they operated as the de facto press for the grand dukes of Florence and they are still in business today. Neri's book was noticed almost immediately; in a 1614 letter addressed to Galileo, Roman Prince Federico Cesi practically begged his astronomer friend to send a copy. Cesi was the founder of the "Accademia dei Lincei" [Society of Lynxes] a group of naturalists who formed an early version of what would later be called "scientific societies." The book was tailor made for such groups who were interested in performing their own experiments, however, sales did not exactly catch fire among the public. L'Arte Vetraria, or "The Art of Glass" as it was dubbed in English, had passed its prime as the bible of glassmakers. As one would expect, methods and technology had matured considerably over the intervening two centuries. Nevertheless, Phillipps is a character for the ages. By his sixth birthday, he already owned over a hundred books; his grand ambition was to own one copy of every book ever printed. He was born in Manchester, the product of a clandestine relationship between a textile baron and a woman to whom his father was not married. Nevertheless, he appears to have been well cared for and inherited what Wikipedia says was a "substantial estate." A fortune that he promptly started to whittle away, spending lavishly on books and manuscripts. He attended University College Oxford and within a few years, he was made a fellow of the above-mentioned Royal Society. Depending on where you stand, Phillipps was a classic example of British eccentricity, a brilliant and dedicated preservationist or a completely obsessed crazy-man. By the end of his life, he amassed an estimated sixty thousand manuscripts and forty thousand books. At the time it was the largest such private collection in the world. 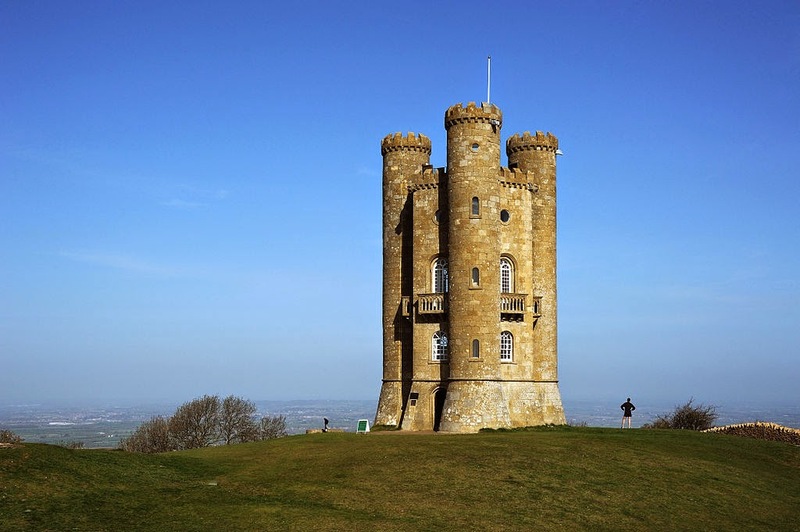 He housed his treasure in a castle that he had built for the purpose, Broadway Tower, in Worcestershire (see photo above). It is said that he would walk into bookstores and buy the entire stock; his agents around Europe provided a steady stream of new material. Apparently, he himself possessed a sense of humor about his odd obsession, coining the term "vello-maniac" (referring to the vellum bindings common to many books of that period). The story does have a darker side, albeit with a silver lining. In 1842, Phillipps started collaborating in research with James Halliwell, then an undergraduate at Cambridge studying Shakespeare. Halliwell became romantically involved with Phillipps eldest daughter Harriett, but Phillipps refused consent for them to marry (which they did anyway). Meanwhile, Phillipps had run through the family fortune and started to borrow heavily. He developed paranoia against Halliwell ever gaining control of the collection. He entered negotiations to donate the books and manuscripts to the British Library, but his conditions were unpalatable and a deal was never reached. He wanted to stipulate that the order of books should never be reshuffled and that no Roman Catholic, especially his son-in-law, ever be permitted to touch or view the collection. He became so fearful about Halliwell that he hired 250 men to move the collection, which took two years, at which point the abandoned castle started to fall into ruins. In the end, Phillipps died at the age of 79 in 1872. After a court decision, Harriett did inherit her father's collection and Halliwell did gain control. The silver lining is that he and his wife carefully dispersed the collection to some of the most prestigious libraries in Europe, a project that took multiple generations to finish. In fact, the final parcel of books from the Phillipps collection sold at auction in 2006, at Christie's. "Thomas Phillipps" Wikipedia, http://en.wikipedia.org/wiki/Thomas_Phillipps .